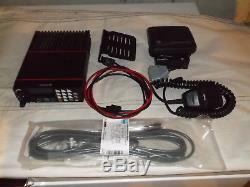 These radios and accessories are from commercial users. They have the normal scuffs and dings from their use. Because these systems are used, I cannot warrant the radios or accessories. How about a rugged radio? Get in on the many 900 Mhz repeaters in use or being constructed around the USA. This band has been called the "new 440". These are great 30 watt conventional channel 900 MHz FM radios. One of the finest 900 MHz radios ever constructed! Built like a tank, yet, have a fairly small footprint under your dash! No need to change the front end filters or modify the VCO in this radio as you have to do in the competition! These are "SYSTEM" control head models. Do the math--included are important accessories such as the under dash mounting bracket (not OEM as those are no longer available), microphone, speaker, and 6 foot power cord (radios, microphones, and speakers will be either GE, Ericsson, or Ma-com--no choice). Radios are currently programmed to all IL/WI amateur radio repeater frequencies (including a few under construction). Radios also have had the "talk-around" front panel and internal conversion done, so need to do that, and are also programmed for the 4 national simple frequencies, which use this function; and the front panel squelch and display brightness. I have included a front panel instruction sheet, and a sheet of the frequencies that are programmed into the radio. I can program the radio, for free, up to 10 repeater pairs plus the 4 simplex frequencies for your area. I normally DO NOT program PL's or DCS into the receive to give you better hearing range. I will if you need it in a high noise area. THE ORION'S WILL ONLY DO A 25 MHz SPLIT AND NO PL TONE OVER 210.7 HZ. THESE ARE NARROW BAND RADIOS ONLY! THE ORION WILL TRANSMIT 902MHz to 908MHz AND 927MHz TO 933MHZ ONLY. THEY WILL RECEIVE 927MHz TO 933MHZ ONLY. Any mistake in programming and repeaters desired forwarded to me are the buyers responsibility. 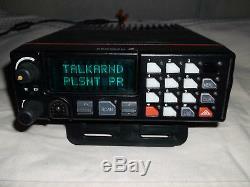 YOU MUST BE A LICENSED AMATEUR RADIO OPERATOR TO USE THIS EQUIPMENT!!! There is no "best offer". The item "GE/Ericsson/Ma-Com Orion 900Mhz HAM Radio withmobile antenna and free programming" is in sale since Thursday, December 7, 2017. This item is in the category "Business & Industrial\Facility Maintenance & Safety\Surveillance & Alarm Equipment\Two-Way Radios". The seller is "milwrd" and is located in Pleasant Prairie, Wisconsin.